G.I.Joe Collectors Club FSS 5.0 Final Round Now Arriving! The final wave of FSS 5 is now hitting mailboxes. It should come as no surprise that Raptor and Steel Raven are the characters found in this final assortment. However, this shipment includes the mystery 13th figure, so we’ll keep that as a surprise. If you’d like to find out who it may be, then join us after the break for discussion already in progress! 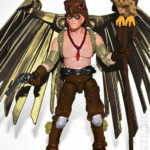 The GI Joe Collector’s Club has just posted up another image of an FSS 5.0 figure, this time, Raptor.